A share just paid its semi-annual dividend of $10. The dividend is expected to grow at 2% every 6 months forever. This 2% growth rate is an effective 6 month rate. Therefore the next dividend will be $10.20 in six months. The required return of the stock 10% pa, given as an effective annual rate. What is the price of the share now? A share was bought for $10 (at t=0) and paid its annual dividend of $0.50 one year later (at t=1). Just after the dividend was paid, the share price was $11 (at t=1). Assume that the CAPM holds and that future expectations of stocks' returns and betas are correctly measured. Which statement is NOT correct? (a) Asset A is underpriced. 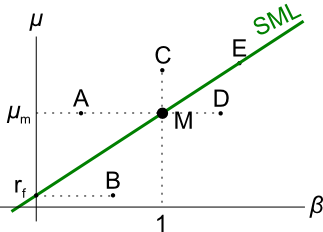 (b) Asset B has a negative alpha (a negative excess return or abnormal return). (c) Buying asset C would be a positive NPV investment. (d) Asset D has less systematic variance than the market portfolio (M). (e) Asset E is fairly priced. Radio-Rentals.com offers the Apple iphone 5S smart phone for rent at $12.95 per week paid in advance on a 2 year contract. After renting the phone, you must return it to Radio-Rentals. Kogan.com offers the Apple iphone 5S smart phone for sale at $699. You estimate that the phone will last for 3 years before it will break and be worthless. Currently, the effective annual interest rate is 11.351%, the effective monthly interest rate 0.9% and the effective weekly interest rate is 0.207%. Assume that there are exactly 52 weeks per year and 12 months per year. Find the equivalent annual cost of renting the phone and also buying the phone. The answers below are listed in the same order.